MUFF WIGGLER :: View topic - quad sound with cocoquantus? i read here (i think it was arnoux?) that the cocoquantus has 4 channel out and how they intended to turn it into a lush bath of quadraphonics... is this possible? how? are there banana mixers? or? don't think it was me, but the topic is of my interest. In the past I used to perform in quad, with an Eurorack system + a Mackie mixer, main actors of the thing were an Intellijel Planar and a Cylonix Cyclebox in quadrature-LFO mode for the automation. I was inputting on the Planar a mono source, going out on the Mackie with 4 cables, splitting the channels on the Mackie in 2 different busses. In this way I was able to let spin around a single mono voice. CocoQuantus has stereo output on the back + the two grey bananas for each delay. You can use somehow the very same technique from above but as you can see, with that set of machinery, it's not so practical money-wise, Planar + quadrature LFO + mixer with 2 different sets of outputs, and beware: with this set up you can let spin just one of the Cocos. The more I think about it the more I'd love to try, anyway, with this set up you can have the stereo out left and right (and you can put i.e. the right channel on the front and the left on the back using the busses of the mixer) and one of the Coco grey out (only the recorded material) spinning around or positioned in the quad field with the joystick. Damn, you can have a hell of movement. Hope that more expert wigglers can join with some hints, quadraphony is the way I'd go as well forever. Cheers and welcome to the Coco club! The CQ2 has only two output channels, hard panned right and left, and the grey outs have no level attenuation, but are essentially duplicates of the stereo output jack with a DC offset. Honestly, the hard panned outs are exactly what you want to use for surround stuff because to get the best results, you want to pull from mono channels into your surround processing, be it hardware, like an Atmos or D&B surround system, or software like Envelop for Live. You can then process the movements of each Coco independently, if you so choose. I'm prepping a set for an Envelop system as I type this. I hope more folks get into spatialized audio. It's several levels deeper in terms of immersive musical experiences. Good luck! so a plumbum hooked up to el coquito should have quad in theory right? since they both have stereo outs? but is it 'true' quad, since the plumbuttah's outputs can't wade into the coco's? oder? Again, no, that's not how quad works. 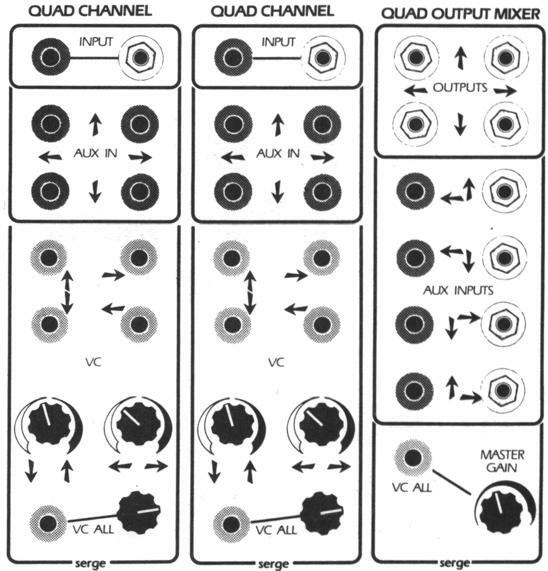 You don't create quad just by using discreet outs on your synth voices and sending each to a corner. Please read up before you ask more questions. Hallo Hainbach, any pic of the beast in the flesh? What is that? This one? @arnoux: Yeah, like that only over a full row. Stunning. You have to ask Darrin at Patch Point for more details.